Okay, so, here's the deal. I love this card. I seriously do. BUT, it is not what I set out for it to be. You see, I attempted to use a super fun technique that Jennifer McGuire taught in the Online Card Classes Clean and Simple 4 class, however, that technique refused to work for me. I plan to try it again, but I was bound and determined to finish this card, so I did, nonetheless. I did incorporate a lot of inking on this one to create my own colored backgrounds, and I sort of love it. First of all, HOW CUTE IS SHE?! Seriously. 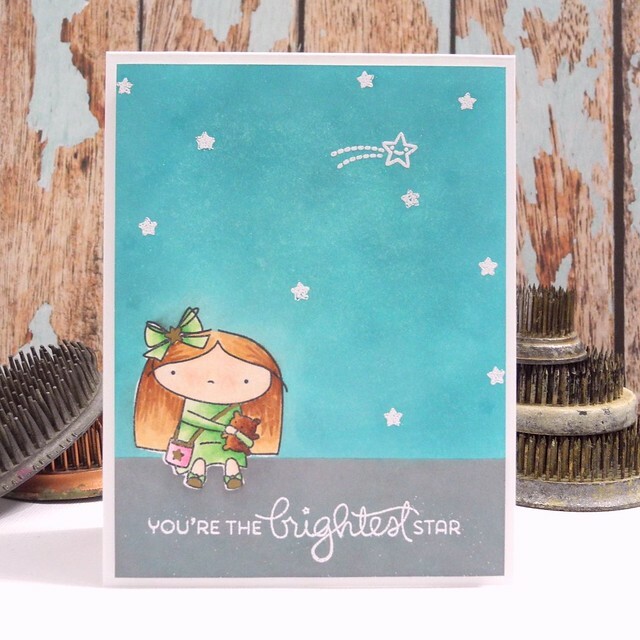 I am in love with this adorable Shooting Star stamp set from Mama Elephant! It makes me smile! YAY! I stamped her first, and then colored with Spectrum Noir pens. I then stamped her on some Post-it tape and masked her off to do the inking. 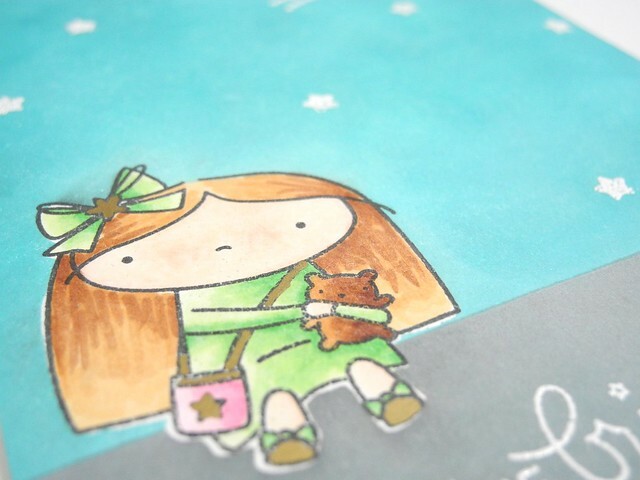 I used Simon Says Stamp inks on Crafter's Companion Ultra Smooth cardstock. I LOVE how the inking blended so beautifully and that this is essentially all one layer! I attempted to use VersaMark over the inked background to have the ink create a cool shadow look for the stars. That's the part that didn't work. BUT, I decided to simply stamp and heat emboss the stars with white powder and I think it looks awesome, so I am happy with it. YAY! this came out so great, I love her too!!! Looks awesome! Nobody'd ever know! I think your card came out great! And I agree, that little girl is adorable! Your card still came out super cute though! And you did a fabulous job coloring her! :) Have a wonderful weekend! Even though things didn't go as planned...This is ADORABLE and ever so pretty!